For the past two days, whenever I link KeePass with Kee on Firefox it starts sending unavoidable warning messages for all the websites I have in the database. When I click “Ok” another warning pops up for the next website in the db. This keeps on going until I either close KeePass definitely or disable Kee on Firefox and restart KeePass. Edit: After checking the database for passwords, it seems that my whole db is corrupted. All my passwords are gibberish. Is there any way to get them back? 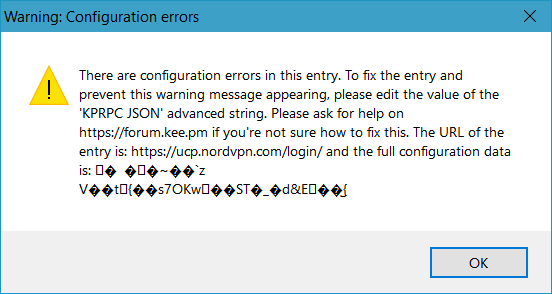 I’ve tried the repair utility of KeePass, it didn’t help. Unfortunately it’s unlikely that you’ll be able to get them back if the database is corrupt enough that the repair feature can’t fix it. You’ll need to restore from your backup, and investigate what caused it - possibly faulty hardware that should be replaced to ensure the problem doesn’t re-occur. The KeePass support forum may have further ideas though and likely has a lot of existing discussions with advice for people that have had similar problems in the past.